The IN-13 is a common neon-filled Soviet bargraph tube with a six inch envelope and a flying lead base. The display is current driven, a source of 4mA is required to extend the bargraph to its maximum length. 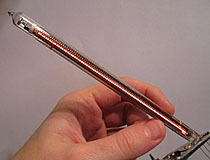 A third lead is provided with short 'starter' electrode; this is lit continuously to force the bargraph to light at the correct end of the tube when activated. The Soviet Union manufactured massive amounts of neon displays up into the 1990s, and Soviet display tubes such as this can be bought on eBay in huge quantities. IN-13 'nixie' neon bargraph tube, shown with bar fully extended.